In unveiling the new name, along with a logo designed in partnership with Toho Co., the film studio behind Godzilla, the federation said the sport of judo had parallels with the so-called King of Monsters who first appeared on screens 65 years ago. Both originated in Japan and are internationally recognized, while the federation has made advances using a video system it dubbed Godzilla to analyze its athletes in competition. 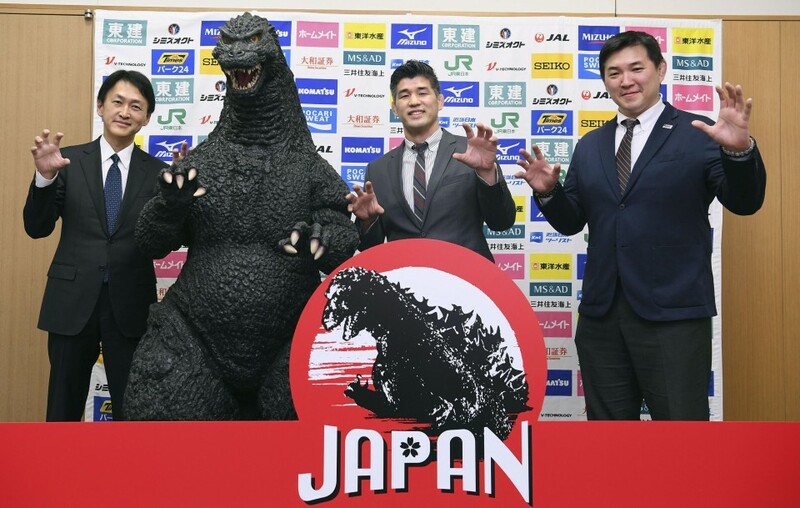 At a press conference featuring an actor dressed as the monster, national men's team coach Kosei Inoue said he hoped to have the power of Godzilla at next year's Tokyo Olympic Games. "In our quest to be the strongest, we're grateful to have such support," Inoue quipped. Inoue, the men's 100-kilogram gold medalist at the 2000 Sydney Olympics, also remarked on the monster's physique. "He has powerful thighs, doesn't he?" he said. According to the federation, some members were wary of the partnership, which was originally proposed by Toho. At a board meeting, some members said the nickname did not meet the "values of judo," but a majority backed the partnership.